Bella Hadid can always be counted on to give good face. This year alone, Bella has blown us away on the covers of American Harper’s Bazaar, Vogue Mexico and Allure — and the year isn’t over yet. Now, the current face of Versace, DSquared2 and True Religion returns to the cover of Harper’s Bazaar Arabia, exactly one year since her last appearance. 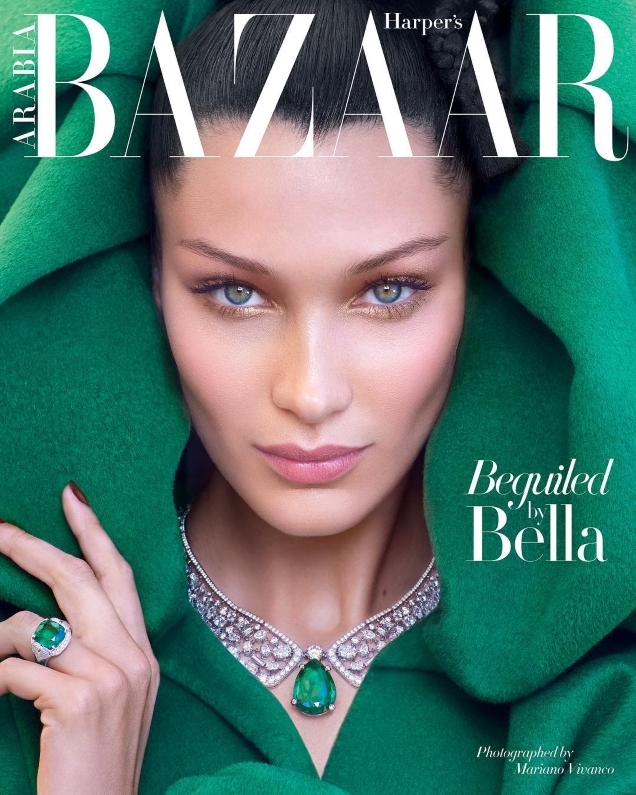 Bella mesmerizes on the magazine’s October 2018 issue, photographed by Mariano Vivanco and styled by Michelle Cameron, wearing an emerald green Valentino number, which perfectly complements her piercing blue eyes. We’ll race you to the newsstand for this one. “Absolutely stunning! Bravo, Bella!” applauded TZ001. “Stunning, she looks perfect, too perfect! Like one of Capote’s Swans, ready to be adored!” Miss Dalloway described. “Bella looks stunning, the emerald green is perfection. The cover is made that much more effective because they’ve just gone with the one color,” admired sweetpop. “Okay, I love this. I usually don’t care for Bella’s work but this is great,” confessed Wintergreen. “A beautiful cover. A little dated and old-school glamour but fresh at the same time, I like that combination. Plus, Bella is drop dead gorgeous,” Morgane07 raved. “Stunning cover. Tops her Allure cover by miles. I really love the emerald princess theme of it. Very well done,” commended SLFC. Mercyminx simply described the cover as “stunning” and we could not agree more. Dare to disagree? Share your thoughts with us here.